For over 900 years, Auckland Castle was a principal home for the Bishops of Durham. Unlike other medieval bishops, the Bishops of Durham held extensive landholdings, levied armies and adjudicated in their own law courts. In a sense, they acted as rulers in the north, and were among some of the most powerful and influential figures in medieval and early modern Britain. Located 12 miles southwest of Durham and adjacent to one of their main hunting parks, Auckland Castle rapidly became one of the Bishops’ most popular residences and a location where they would live, work and entertain important guests. It became their sole, official, residence in 1832. Auckland Castle was eventually sold in 2012, and is now held in perpetuity as part of The Auckland Project, an arts, faith and heritage destination being created in Bishop Auckland. The former private palace is currently benefitting from a multi-million pound, HLF-funded, project to conserve and re-present the state apartments and domestic rooms, and provide new learning, catering, retail, and visitor facilities. The project focuses on engaging visitors with the forgotten story of the Prince Bishops and their role and place in the history and faith of the nation. Auckland Castle remains, however, a living and working site, housing the offices of the present Bishop, the Rt. Rev. Paul Butler. Due to the longevity of the site, surviving standing remains provide tantalising glimpses into the scale and nature of the complex at different points in its history. The oldest portion is St Peter’s Chapel, formerly the Great Hall begun by Bishop du Puiset in c.1190. In the later 13th century, Bishop Bek constructed an additional range. Parts of the site were then destroyed during the Commonwealth (1649-1660), with much of the complex being restored and added to by Bishops Cosin, Trevor and others in later centuries. The complex evolved to meet many different demands throughout its lifetime but there many outstanding questions regarding its form, use and purpose, particularly during the 12th, 13th and 14th centuries. 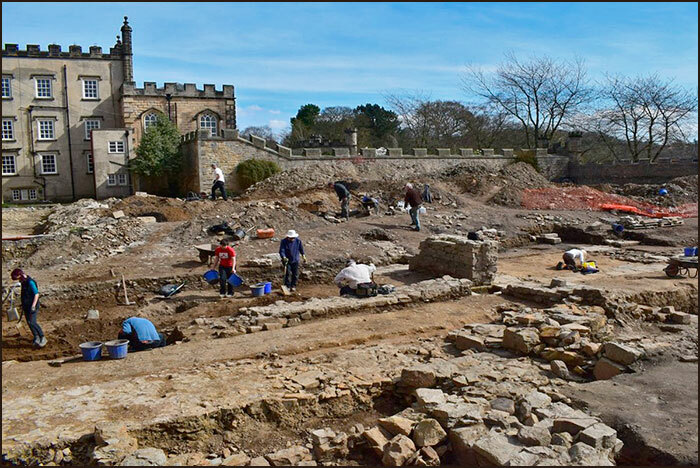 In recent years, Durham University Archaeological Services (ASDU) have been engaged in archaeological investigations and excavations commissioned by The Auckland Project ahead of the development of Auckland Castle. These have uncovered the remains of previously unknown medieval building ranges, together with many other archaeological deposits and features. Collaboration with The Auckland Project has identified some important areas for research and given the opportunity to undertake a series of targeted excavations with the aim of answer key questions relating to the scale and nature of the earliest medieval phases of occupation at the site. This project is led by Professor Chris Gerrard and Dr Pam Graves in partnership with The Auckland Project, and works closely with members of ASDU and local volunteers. In addition, this project will function as the training excavation for Durham University first year Archaeology Students.